Some of you may recall my fondness for mantidflies (Mantispidae), which in their chimerical selves mix an outlandish appearance and (in the case of Symphrasinae and Mantispinae) parasitoidal youth; the latter have a hypermetamorphic ontogeny with which anyone fascinated by the aberrant should be familiar. With this hook, I would like to briefly bring attention to a recently established family apparently akin to mantispids: the Dipteromantispidae, which consist of two fossil genera that bookend a time-frame of 125-89 m.y.a. and inhabited North America and Asia. The raptorial forelegs and wing venation of Mantispidiptera (the younger and New Jerseyan of the pair) showed a resemblance to the mantispid subfamily Symphrasinae, resulting in its classification as a mantidfly (Grimaldi, 2000). This seems unsupportable for a number of reasons (Wedmann & Makarkin, 2007)–not only does it lack the prolonged pronotum that sets mantispids (aside from the Symphrasinae; Reynoso-Velasco & Contreras-Ramos, 2008) apart from other Neuroptera and possess basally separated media and radius in their forewings (which are fused among all mantidflies), but both this genus and its Manchurian elder Dipteromantispa are bizarrely distinct from all other neuropterans in that their hindwings are completely reduced to haltere-like structures, in the manner of true flies (Diptera). Thus, while they do appear to belong within the Mantispoidea, the establishment of Dipteromantispidae is an obvious systematic course of action (Makarkin et al., 2013). One naturally wonders what biological pressures could lead to this adaptation. Brachyptery* with respect to the hindwings occurs in a number of instances throughout the Neuroptera, mainly within the Hemerobiidae (brown lacewings) and Coniopterygidae (dustywings); like dipteromantispids, the latter possess highly reduced wing venation. Reduction or loss of wings is associated among these families with habitation of windy environments (and therefore flightlessness), such as remote islands or mountaintops (Oswald, 1996; Sziráki, 2007): but this evolutionary process, and the specialization of hindwings to form stabilizing appendages, are dissimilar in their known causes: in Diptera, their development was associated with a strengthening–not weakening–of flight. It was presumed that the reduced venation of Mantispidiptera was the result of miniaturization (Engel & Grimaldi, 2008): again, by analogy with dustywings, which are generally the smallest net-winged insects. However, Dipteromantispa is far larger than the North American genus and has vastly more specialized venation. Thus, by analogy to the venational reductions observed in macrolepidopterans (for example) and the aforementioned etiology of halteres, it can be concluded that dipteromantispids were vigorous fliers (Makarkin et al., 2013): perhaps of the same caliber as owlflies (Ascalaphidae), which have the capability to hover. I don't know about you, but the thought of hovering quasi-mantidflies pouncing on prey out of the air (dipteromantispids were evidently predaceous) strikes me as pretty darn spectacular. Engel, M. S. and Grimaldi, D. A. (2008). Diverse Neuropterida in Cretaceous amber, with particular reference to the paleofauna of Myanmar (Insecta). Nova Supplementa Entomologica, 20, 1-86. Grimaldi, D. A. (2000). A diverse fauna of Neuropterodea in amber from the Cretaceous of New Jersey. In Grimaldi, D. A. (ed. ): Studies on Fossils in Amber, with Particular Reference to the Cretaceous of New Jersey (pp. 259-303). Leiden: Backhuys Publishers. Oswald, J. D. (1996). 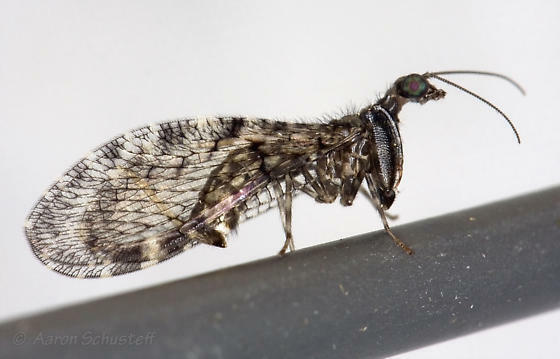 A new brachypterous Nusulala species from Costa Rica, with comments on the evolution of flightlessness in brown lacewings (Neuroptera: Hemerobiidae). Systematic Entomology, 21, 343-352.